The Hermitage Inn 23 Castle Street Warkworth NE65 0UL Tel: 01665711258 www.hermitageinnwarkworth.uk The Hermitage Inn is an 18th Century Grade II listed building. 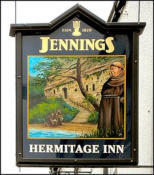 It has been an Inn since it was first built and 'Hermitage Hotel' is marked on the 1st Edition Ordnance Survey Map dated 1860. 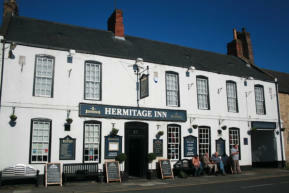 Located adjacent to the Market Place near the junction between Castle Street and Bridge Street, the Hermitage Inn has been at the centre of village life in Warkworth and continues to play a key role in the life of this vibrant and notable village. Inside the Hermitage, guests can appreciate the tastefully restored decor and surroundings which give clues to the Inn’s long history and status in the village. 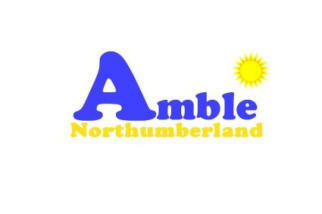 The Hermitage Inn takes its name from the Hermitage – a late medieval cave and the chapel of a solitary hermit which is located half a mile from Warkworth Castle on the River Coquet and accessible only by boat.